The title of this book speaks to me, of course: although teaching and assessing 21st century skills is by no means the only thing we should be doing in our schools, regular readers here recognize the importance I place on helping our schools do a better job of helping students have the critical higher order thinking skills and practical communication and collaboration skills to be highly effective problem-solvers. This Solution-Tree publication, part of a “classroom strategies series,” isn’t a narrative by any means, not a summer reading recommendation qualifier, but rather a bit of a stodgy, text-book like overview of the topic at hand. It is probably primarily intended for students, which can be seen in the comprehension questions at the end of each chapter, and so it may influence future generations of teachers in its framework. Two takeaways loom largest: one positive, one negative. After discussing each, I’ll run through some smaller points. The strongest element offered in the book lies in its enriched and broadened definition of 21st century skills. 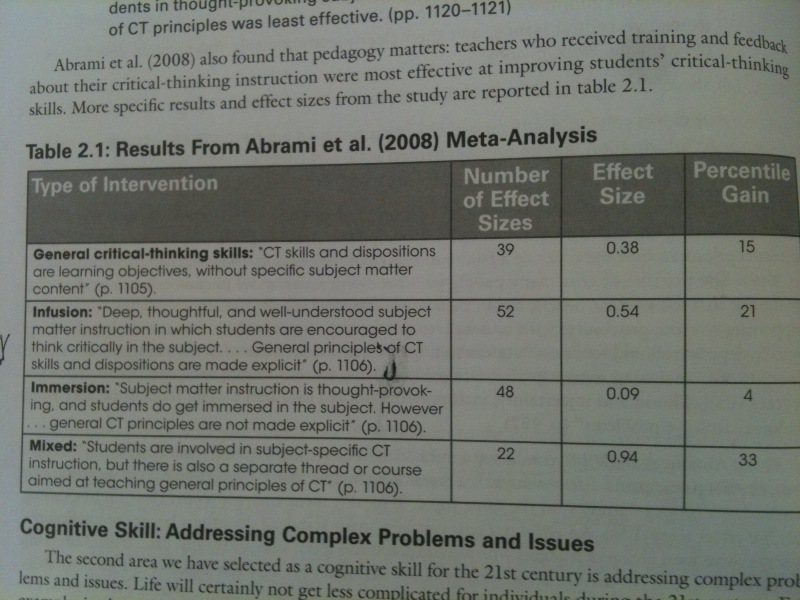 Rather than accepting a simpler list of skills such the 4 C’s (Critical thinking, Communication, Collaboration, and Creativity), Marzano/Heflebower set out a set of both cognitive and what they call conative skills, and put them on an equal plane. More than that, they round out conative skills to include a wide range of what I sometimes think of as character skills–character broadly defined. What is conative? My spell check here doesn’t recognize it– it appears throughout my draft with an ugly squiggly red line beneath. The Free dictionary defines conation as: The aspect of mental processes or behavior directed toward action or change and including impulse, desire, volition, and striving. Nice; I like it, and may add it to my vocabulary. Conative skills refer to one’s ability to analyze situations in light of what one knows and feels and select appropriate actions…. where personality and intelligence overlap to facilitate decision making. A simplified way of thinking about conation is that it is the process of combining what one knows (cognition) with what one feels (affection) and deciding what action to take in light of both. Previously to this, I have usually set “conative” skills to the side– not as undesirable, but as existing in a different category from “21st century skills.” The work we did at St. Gregory to broaden student reporting of learning to include a skill set of what we called “essential goals” for our students, I often explained, included a mixture of 21st century and character, moral and performance character, goals and skills– but it closely matched this Marzano set of 21st century skills defined widely. Understanding and Interacting with Others. The cognitive skills provided are mostly familiar, although it is useful to expand thinking skills to include mental models and visualization, which I sometimes overlook or underplay. The conative set includes the “working with others” piece which is so important, and I love the way they rope in things which I also believe to be SO important– the growth mindset, resilience, and optimism– and which sometimes I and others leave outside, as softer, “psychological” stuff which are less critical. Dweck and Seligman have influenced my world view, and my own internal, mental attitudes, enormously in the past decade, and it is terrific to see them get this prominent play here. The big weakness: The book fails, and fails deeply I think, in offering far too little thinking about structuring curriculum and learning experiences broadly, richly, and holistically so as to “teach and assess 21st century skills.” Though there are many fine slices and slivers of lessons, some of them just mere moments, by which teachers can advance the book’s purpose, they are sadly discrete, isolated, individual islands. The assessment chapter is almost heartbreaking. The book’s title treats the two topics, teaching and assessing, equally; look at the cover,where they have the same size. But assessment is tacked on in one chapter at the very end, a short chapter of 15 pages, representing less than ten percent of the book. 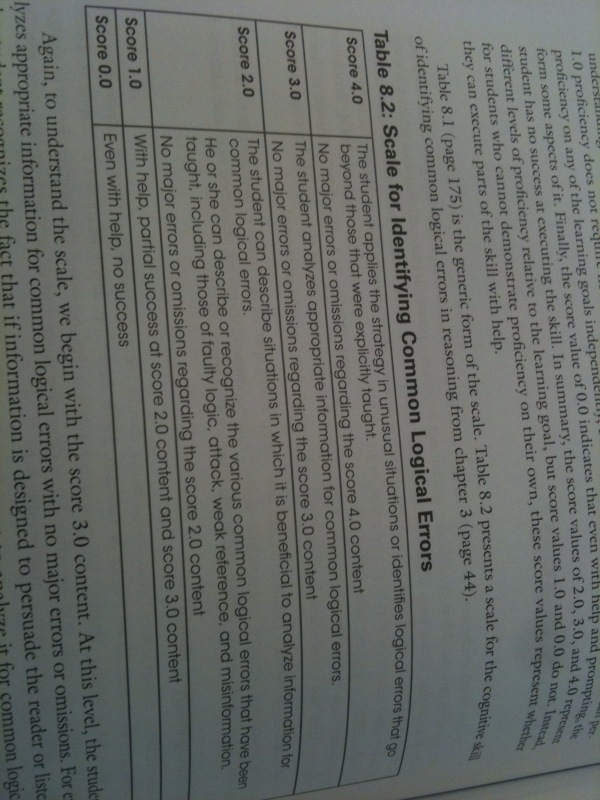 And what is provided in the assessment chapter? Templated rubric forms for rating student learning on a 1-5 scale, blandly and generically. There is so much richness to be explored when discussing assessing 21st century skills– projects, products of all kinds, presentations, postings, performance tasks, peer teaching, richly designed new applications of understanding, and much more– and yet this book completely takes a pass. On one page (one page) there is a charming reference to Project Based Learning. Experts are cited to the effect that “PBL has a deeper, more complex goal than traditional instruction,” and that “PBL is significantly more effective than traditional instruction to train competent and skilled practitioners and to promote long-term retention of knowledge and skills.” But having told us these two things, there is no, not one, further reference to PBL or to related, richer, more meaningful teaching and learning of 21st century skills. One takeaway from this research is seeing anew the wisdom of the IB curriculum, both for the way in which critical thinking skills are expected to be elevated and made more explicit in general courses, and, especially, because of the mandated course in Critical Thinking skills, the Theory of Knowledge. Every school, when undertaking curricular review of 21st century skills and critical thinking, ought to review this particular table and apply to their planning. 2. I really appreciated the attention given to the value of conflict and controversy in the curriculum. “Although it might seem counter-intuitive” there are a number of benefits to conflict and controversy… which promote transitions to higher stages of cognitive and moral reasoning.” Let’s not shy away; let’s “teach the controversy” and elicit it among our students to sharpen their thinking and communication, and to develop their negotiation and compromising skills. Note: Sadly, the “teach the controversy” strategy coined and advocated by Gerald Graff which influenced me so much as a teacher in the ’90’s has been reconfigured as an argument, a flawed and faulty argument, to teach intelligent design and/or creationism alongside natural selection in high school and college biology. This is a shame, and I have to learn to not advocate for it without clarifying what I mean. 3. There is a valuable eight step protocol provided on page 88 for effectively grappling with difficult problems to develop stronger problem-solving skills. The vignette provided however, of the problem-solving in action, is shallow rather than rich, and is another missed opportunity to probe and provide examples of deeper learning. 4. As a former (and future!) teacher of high school philosophy (I even presented on a panel of an American Philosophical Association conference on High School Philosophy teaching in 1998), I enjoyed the discussion of using “thought experiments” to strengthen mental modeling, visualization, and hypothetical reasoning. This is a terrific five page section, and invigorates me to want to teach these suggested lessons. 5. There is a nice discussion of the significance of the interpretive stance we all view the world from, and how much we should help students become more metacognitive of our own interpretations. Moving from optical illusions to cultural interpretations, the discussion is a good, if limited primer. Once again, however, the “vignette” of a lesson feels thin and limiting. Digital natives are not proficient in finding and evaluating information, they remind us, and offer a great list of the many mistakes students make- 11 of them!- including having little patience, stopping short when reading large amounts of text, and searching for just one correct answer. 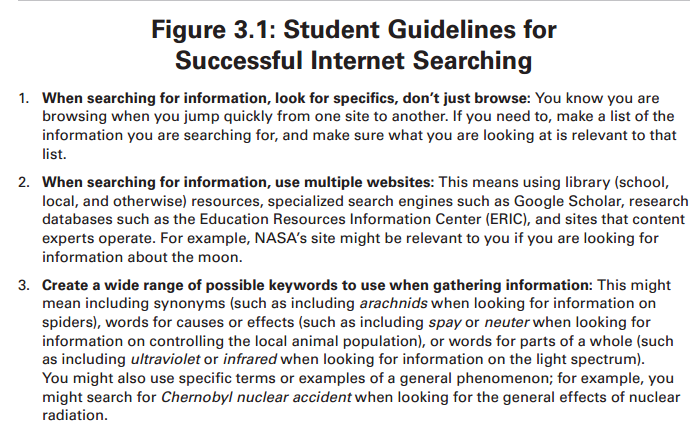 They then provide a useful table of search guidelines that could be posted in every classroom in the land. The full table is available for free, reproducible download here; below is a snippet. 7. 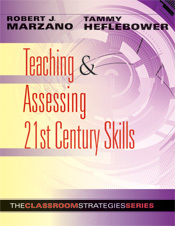 Marzano/Heflebower rightly put a focus on focus. Concentrated attention and resisting distraction are absolutely fundamental 21st century skills, and they are correct to to emphasize and guide us on them. Perkins (1981) explained that an intense focus on complex material puts an individual in a frame of mind and exposes him or her to information and phenomena that are more likely to lead to meaningful moments of clarity or discovery. My own preference is to seek out the middle ground: intentionality about purpose comes first, and after deciding what our goals are for a particular session, we choose the strategy, focused attention or multitasking, which best serves that purpose. The coming together and intermixing of different elements; the jumping from hyperlink to link, not knowing where we are going but enjoying the intellectual journey; the willingness to open our minds to what we didn’t know we were seeking: all can be enhanced by multitasking. Returning from the smaller points to the larger, Teaching and Assessing 21st century skills deserves high praise for its thoughtful and important broadening of the definition of 21st century skills, unifying a broad array of best current thinking about what is most important for our students (and ourselves) to learn and practice to be highly effective thinkers and actors in changing times. However, it fails in being a very valuable “strategic” guide, as it promises on the bottom of its cover (“the classroom strategies guide.”) It fails because its counsel is consistently so narrow, so fragmented and discrete. Perhaps were it to describe itself as a “classroom tactics guide,” it could be moderately redeemed. The suggestions throughout the book, many of them very good, are just that, tactical only, sadly failing to provide a bigger picture of a more authentic, holistic, rich and meaningful 21st century skills learning environment and assessment program.